Have you been frustrated trying to figure out what’s real and what’s not when it comes to creating a Web site for your business? 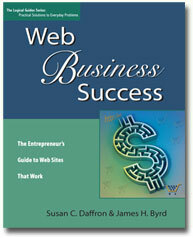 Our names are James Byrd and Susan Daffron and we wrote Web Business Success: The Entrepreneur’s Guide to Web Sites That Work after years of dealing with clients who had been overwhelmed by conflicting and confusing information online. We have run our business from a log house deep in the woods of Idaho since 1996. Most of our clients and customers are “virtual;” we’ve never met them in person. Over the years, we have spent hours and hours wading through information about creating Web sites, online marketing, and operating an online business. In the process of doing all this research, we figured out automatic, low cost ways to generate new clients, make sales, and earn money all while we focus on work we enjoy. It’s not impossible to create a rewarding and satisfying online business. We’re proof that you can create a Web site and run an online business from almost anywhere without losing your soul, your mind, or your shirt. Web Business Success is filled with all the practical tips and secrets we have been giving our clients for years. Whether you plan to hire a consultant or create a business Web site yourself, Web Business Success gives you the information you need to avoid wasting a whole lot of time and money getting your business online. Business owners, authors, consultants, and have all praised the no-nonsense advice in Web Business Success. Read more about what our readers and the press have said about the book. Whether you are an overwhelmed businessperson or frustrated cubicle dweller, a high-quality easy-to-use Web site is the first step on your path towards online business success. It doesn’t matter if you want to expand an existing business online or start up a purely online business. Either way, a good Web site is the key. Create a plan for an effective business Web site. Instead of “ending up” with a site you don’t like, you’ll have a plan for a site that is right for your business. Understand Internet terms and concepts. You won’t be “snowed” by a lot of buzzwords anymore. Everything is explained in plain English. Web Business Success also has a complete glossary and index. Unlike a lot of “techie” books about Web sites or ecommerce, Web Business Success is designed for business owners, not nerds. You don’t have to be a geek to sell things online or have a Web site. Check out a PDF file that contains the table of contents and the first chapter (889K). Note that because it’s a PDF file, you need the free Acrobat Reader to view it. If you’ve been feeling like you need some kind of consultant or geeky friend to help you navigate the murky waters of Web business, you need Web Business Success: The Entrepreneur’s Guide to Web Sites That Work. If you’ve been procrastinating about getting your first Web site online, do yourself a favor and get the book that cuts through the clutter with the proven strategies and techniques you need to know to earn a decent income online. The bottom line is that a Web site is the first step toward a Web business. We live in an area most people don’t get to live in until they retire. If we can do it, you can too! Because Web Business Success is based on our real-world experience, you can rest assured that you’ll learn all the tips and techniques you need to know to create a Web business that actually works!